Viewpoints: Is a salary of £300,000 a week too much? After a summer of speculation, Welsh forward Gareth Bale has finally completed a world record £85m (100m euros) transfer from Tottenham to Real Madrid. He will earn a reported £300,000 a week after signing a six-year contract. But are sky-high footballers' wages too much? Bale's new contract means that he will double the yearly salary of UK Prime Minister David Cameron within just a week of work. In return Real Madrid will be gaining one of the best players in the world, as they look to return to the summit of European football and win their 10th European Cup. But at a time when many supporters struggle with rising ticket prices, are footballers' wages too high? Gareth Bale's new employers Real Madrid will - if reports are to be believed - be paying him more than £250,000 a week. That's £13m a year. Put another way, the Welshman will earn in just seven days what many of those who'll follow him in the stands at the Estadio Bernabeu earn in an entire decade. Nice work if you can get it. While the cost of watching Real Madrid in the Bernabeu in La Liga hasn't quite scaled the heights of big-time Premier League clubs yet, ticket prices have been rising rapidly in a country where most clubs are skint after decades of overspending. Unemployment in Spain afflicts one in four, rising to more than one in two for young people. And you thought it was bad enough here! As former Football League chairman Lord Mawhinney said: "Football doesn't have an income problem. It has a spending problem." Too right. At a time when income from broadcasters and sponsors has never been higher, ticket prices are in orbit, yet record numbers of clubs are drowning in a sea of red ink. Sky-high player wages put upward pressure on ticket prices. If you've paid an arm and a leg for a ticket and you see somebody playing for your club wandering around the park like love's young dream, apparently totally uninterested in getting his finger out and putting in some effort, this adds to an increasing sense of alienation amongst many supporters. Football needs to keep ticket prices down, indeed cut them, if it is to remain the people's game. Footballers' wages are dictated by the market. Football, like any other industry, conforms to supply and demand. The football industry is a multimillion-pound industry worldwide, so the purveyors of that industry should reap the benefits. Especially when you're talking about the upper echelons of football, [those guys] really are the minute percentage. And just like the minute percentage of actors receive [and] musicians may receive millions upon millions per album [or movie], the minute of footballers will receive the best wages according to the income of the industry. My opinion is that the high wages may well create a disconnect between the fan and the player because there's a distinct lack of comprehension about the figures, myself included. I'm a former professional and I never escalated to the levels of what our current professionals earn at the high end. So when you think of £20,000-£30,000 a week, that's beyond my comprehension, [and] when you factor that out by 10 and say £200,000 or £300,000 a week, that is way beyond my comprehension. But so is the income of £50m a movie, so is the income of Mr Bill Gates, so is the income of many other people. The thing that makes footballers' wages such a controversial subject is that football is tangible to every human being, whereas being the founder of Microsoft or Apple, or one of the greatest actors the world has ever seen, is not. Football is a sport that has become an entertainment industry, where the consumer demands a standard of product but they consume that product to be entertained. It's no longer a sport. [A footballer's career is also more fragile], the average career span of a footballer is eight years. A musician or an actor's [career] can be anywhere between a one-hit wonder and a full 30, 40, 50, 60 years in the career. Football at a maximum is between 16 and 20 years. Like most logical people, you realise that because [football is] a business, and [owners] make a lot of money out of football players, [it] then becomes like a vicious circle [of increased wages]. But it seems to have spiralled out of all proportion and seems utterly absurd and ridiculous, especially when people working very, very hard can barely scrape a living. It's obscene almost, and especially over the last five [to] 10 years where it seems to have become more and more ridiculous the amounts of money that people are willing to pay them. It's almost provocative, in a sense, when the whole world is in crisis [that] you've people in the entertainment business who are just making so much money - and obviously that goes the same for other groups of entertainers. We were saying yesterday that there should be a salary cap and somebody even suggested a wage according to performance - all of these are just suggestions but it shows that people are thinking about how absurd it seems and that something has to be done about it. Sometimes ticket prices go up but facilities for fans get worse or are not very well maintained. Everything becomes more expensive for supporters, it's ludicrous really. My granddad was so passionate about football that he would have played for nothing. He would have managed for nothing. He always said that you just need enough [to get by], he wasn't into luxuries or anything like that - that's the way he'd been brought up. He believed that people who really wanted to play should feel the same way. Obviously there were arguments about money then as well but that passion to play is the most important thing. Some players nowadays aren't really that interested about the game as a game. Is Gareth Bale worth £250,000-£300,000 a week? To the average man or woman on the street the answer is likely to be a resounding no. However when considering the earnings of individuals we should take account of supply and demand. In the case of supply factors, superstars (whether this be in sport, music, movies) typically command higher salaries because these individuals are in scarce supply and not because they are more deserving than, say, teachers or nurses. In general, the more unique the skillset the individual possesses the higher the potential salary. Demand factors are also important. Why would a firm, or in this case a football club, be prepared to part with this kind of money? The obvious answer is that they will expect to receive some kind of return on their investment. Essentially Real Madrid, and football clubs more generally, believe they will be more successful and their brand more lucrative (through merchandising sales, advertising and sponsorship deals) with star players such as Bale in their team. Overall, the combination of big demand and limited supply is what generates such high salaries. Much has been written about Bale's contribution to Tottenham in the number of crucial goals he has scored and the number of assists - and his performances in European competitions over the last few years have undoubtedly increased his market value. At 24 years of age he is still relatively young (most footballers reach their peak around 28). Real Madrid have a history of signing high-profile players (Galacticos). Bale has been purchased by Madrid to deliver on-field performance but his potential contribution off the field - and the revenue streams this is likely to produce - has also contributed to the size of the transfer fee and salary Madrid have willingly paid. Clearly Real Madrid are looking to Bale to achieve an impact similar to Cristiano Ronaldo. 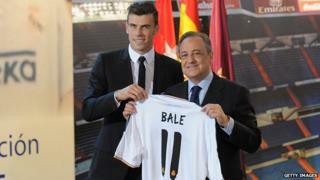 Now he is officially a Madrid player, the launch of brand Bale can really begin in earnest. Madrid missed the opportunity to show him off to the world during Sunday's midday kick-off against Athletic Bilbao in what would have been prime-time in Dubai, from where their shirt sponsor Emirates would have been watching. Emirates are now counting the days until January when they hope Madrid will play a lucrative friendly in La Liga's mid-winter break against them, with Bale as the main attraction. "I think it is a commercial operation," said Real Madrid's former sporting director Arrigo Sacchi earlier this summer. "I think Madrid, through their sponsors, have decided to buy a British player." Are football's traditional links to the working class being undermined by sky-high wages, £50m transfer and match tickets up to £126? BBC Consumer asks a fan, a fansite owner and a finance expert for their views. Madrid certainly saw how, when Neymar signed for Barcelona, the Catalan club signed a new deal with Panasonic just days later. The audiovisual giant was already one of the player's sponsors in Brazil and Bale will cede 50% of his image rights to the club. They will want him to keep pushing up the 512m euro income they registered at the end of the 2011-12 season - figures that keep Madrid inside Financial Fair Play regulation and prevent too many questions about an estimated debt of close to 600m euros. They were top of the latest Forbes football rich list and Perez [Florentino Perez, the current president of Real Madrid] sees the acquisition of Bale as keeping them there.